Beijing (The Economist) – This time of year can be a tough one for factories in areas surrounding Beijing. To keep the capital’s sky clear of smog during the annual session of China’s parliament, which begins on March 5th, officials often order polluting firms to close down for several days. This year many are reported to have done so. Such measures, however, do little to calm an anxious public. 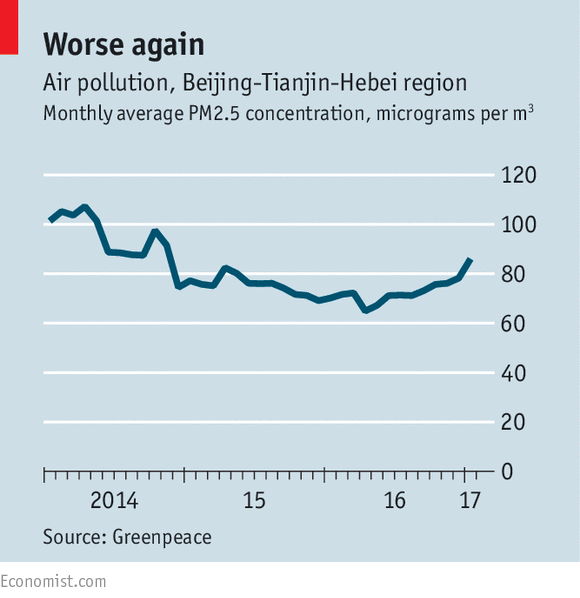 In recent months, amid persistent dense smog in Beijing and many other cities, alarm and anger have been growing. A few brave citizens are beginning to protest. It has taken many years for public anxiety to reach this level. A decade or more ago, censors kept talk of smog to a minimum in state-owned media. Worrying about air pollution was largely the preserve of foreigners. Many Chinese netizens scoffed at athletes who turned up in Beijing for the Olympic Games in 2008 wearing air-filtering masks. But the government is now far more open about the hazard, and the public far less blasé. At a children’s hospital in Beijing, parents carry toddlers wearing child-sized pollution masks. They fret about their children’s lingering coughs—could the smog be the cause? A balloon-seller outside the hospital is sure of the answer. “It is always busiest in the winter since the freezing, dirty air is so hard on the young ones,” she says. The government takes a dim view of any organised effort to put pressure on it. But in recent months parents in several cities have been posting demands online for the installation of air-filtration systems in their children’s schools. Officials in the capital agreed to do so, but only in some of them. The failure of other cities to respond at all has enraged many parents. “Are the lives of children in Beijing worth more?” asked a Chinese microblogger. In December residents of some cities attached masks to public statues to show their anger (sculptures thus adorned are pictured at Beijing Zoo). In Chengdu, in the south-west, police dispersed a small crowd taking part in such a protest and detained several participants. Last month discontent erupted in the north-eastern city of Daqing over plans to build an aluminium factory (such factories are big emitters of particles that cause smog). Thousands gathered outside the city government’s headquarters, many holding up signs saying “refuse pollution”—even though the authorities had already agreed to suspend the project. Citizens of Daqing have cause to be sceptical: in November state media said officials there had failed to issue a red alert when lung-invading particles, known as PM2.5, exceeded a particularly hazardous level. Such alerts annoy local officials because they require the closure of factories and schools, and measures to curb traffic. Some anti-smog activists are turning to the courts. The first known attempt to do so was in 2014, when a man in Hebei province, which surrounds Beijing, demanded compensation for smog-related costs such as air-purifying machines, face masks and the purchase of exercise equipment for use indoors because of the foul air outside. The case was unsuccessful, but it attracted sympathetic coverage in state media. Recently a group of lawyers filed a suit against the city government in Beijing, alleging it was not doing enough to keep the air clean. The plaintiffs say officials have been warning them to withdraw it. The court has not yet responded. “All of us living in northern China are victims. This is a personal issue,” says one of the lawyers. As state media admit, smog is likely to be a topic that is much discussed at the 12-day parliamentary session. The forecast for its start: haze.